The high-pressure Wall-Air Filtration Panels convert shop air used for pneumatic tools and equipment to clean breathable air. The panel provides from 1 to 8 airline respirators a portable source of up to 15, 30, 60 or 100 CFM of breathable air from 5-125 psig. 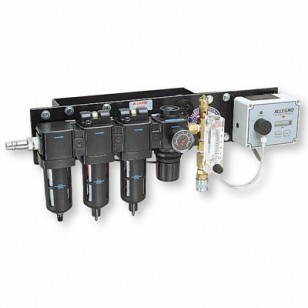 The 3-stage filtration system purifies compressed high pressure air removing water, oil and particulate contaminants. An optional carbon monoxide monitor can be operated in AC or DC mode (9-volt battery) activates an audible alarm when the concentration of CO exceeds 10 ppm (set for 5 ppm in Canada). The included pressure regulator has a pressure gauge and adjustment knob with locking ring. An adjustable pressure relief valve protects the CO monitor and respirators in the event of regulator failure. All models meet NIOSH requirements for point-of-attachment.